Savannah monitors are larger pet lizards that are known to be some of the more docile lizards of the monitor group. They aren’t really active lizards but usually tolerate handling quite well. They are stoutly built, with relatively short limbs and toes, and skulls and dentition adapted to feed on hard-shelled prey. The pattern of coloration of the skin varies according to the local habitat substrate. The body scales are large, usually less than 100 scales around mid body, a partly laterally compressed tail with a double dorsal ridge and nostrils equidistant from the eyes and the tip of the snout. The minimum size of an enclosure taking into consideration that an adult should be able to move about freely in any direction, should be 2.5 x 1.2 x 1.2 meters (8 x 4 x 4 feet). Stay away from open-mesh enclosures as these monitors must be kept warm and, unless you live in a consistently warm environment yourself, it will be costly and complicated to get such an enclosure heated to the proper temperature. Several hiding areas should be located throughout the cage. 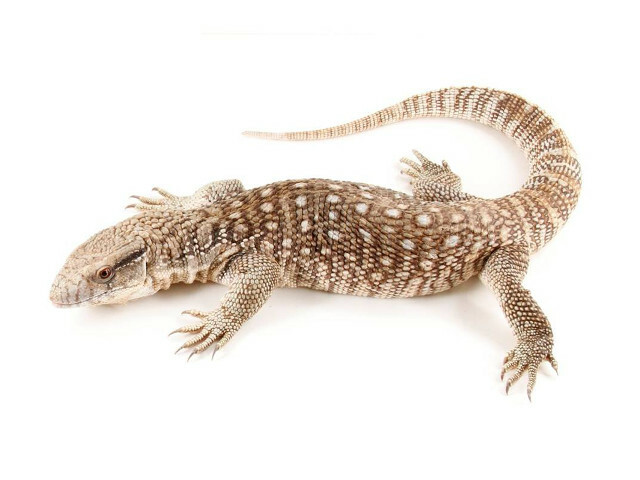 If you wish to keep your Savannah Monitor healthy and alive for more than a year or two, you simply must provide a large sealed enclosure with a solid 0.6 meters (24 inches) of soil that will hold a burrow without collapsing on the animal while it spends most of it’s time in there. The preferred substrate of many advanced keepers is a mixture of soil and sand (Bio-active). It’s recommended to provide UVB fluorescent tubes on timers that should change to simulate natural daylight hours depending on the time of year. For optimal basking, without risk of burns, it is common practice to use a cluster of three smaller 45 to 50 watt halogen flood lights rather than one big light. Optimal basking temperatures should be right around 55-68 °C (130-155 °F) and be broad enough to cover most of the lizard’s body while sprawled out under the lamps. Warning! the use of a single high wattage lamp will burn your lizard and dry out the air in your cage. Provide them with a water bowl or tub big enough for them to submerge themselves (they can stay underwater for extended periods of time). They will drink their water, and may defecate in it, so the bowl must be checked at least once a day to keep it clean and filled. Savannahs are also handy at tipping over water tubs, so make sure to use sturdy, bottom-heavy crocks or tubs. The humidity inside your enclosure should range from very low (directly under the basking lamps) to very high (nearly 100% down in the burrows and about 60% overall humidity on the cooler end of the cage. A high quality digital hygrometer is mandatory for monitoring the environment inside your enclosure. Guessing the humidity will not work. A proper Savannah Monitor diet would consist of Roaches, Crickets, Night Crawlers (Large earthworms), Mice, Rats, Snails, Garden slugs, Superworms and Locusts (where available) and certified chemical free organic whole Shrimp, Crabs, Crayfish & Chicks. Some of the worst things people could ever feed their captive Savannah Monitors are Dog food, Cat food, chicken parts, ground turkey, animal parts(Lacking essential minerals) and boiled or scrambled eggs & cooked foods. (Cooking destroys nutrients). During the first year, food is dedicated to growth and development. Juvenile savannahs should be fed daily a variety of diet as described above. Some people sustain them on just mice. With variety, we know we are covering all the nutrients. Once they reach adulthood feed every other to every third day. You should make sure that the feeder never exceeds the size of the head of the monitor. By constantly handling a monitor in the hopes that it will “tame” you’re actually teaching it that you’re a NEGATIVE experience and it will hate you! But by associating positive behavior with a positive reward, like food, the animal starts seeing you in a positive light. That is how you begin the “taming” process and “tame” a monitor. Remember a “tame” monitor will still not let you just pick it up out of no where ( for the most part) and handling just for the fun of it is still bad, but it will not be scared of you and will actually come to you too see what’s up (food??) And nothing is cooler then having your pet varanid beg for food or beg to be let out. If you are using the Bio-active substrate the only thing you have to do is spot cleaning and changing the water daily or more if the monitor defecate in the water bowl. Varanus exanthematicus will usually shed in pieces. If you provide the proper humidity there are usually no problems. Failure to provide sufficient basking temperatures and correct humidity, as well as supported burrowing, is stressful the lizards internal organs and leads to dehydration and gout.